This unusual surname is an English form of the famous Irish surname O'Hannigan. The clan is most recorded in the counties of Tyrone, Dublin and Waterford, itself an interesting fact, as these counties are about as far apart as it is possible to be! This suggests that in ancient times the clan, which may have originated in Co. Limerick, was troublesome to the then rulers, and as was common in Ireland, if this was the case, members would be dispersed to different parts of the country. A second possible explanation is that the original nameholders were not Irish at all, since it is believed that the name does translate as the 'Son of Hann' a short form of Johann, a continental form, not found in Ireland before the 1170 Norman Invasion. Yet another explanation is that the name is another spelling of O'Hannon, but again there is no definite proof, and it maybe that all the examples have a part to play. The surname in its recognizable modern form is 16th century as shown below, the nameholder being granted 'English liberty'. In effect this meant that he had shown loyalty to the English crown, was trusted, and could pass unheeded between the countries. 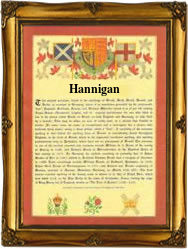 The modern spellings include Hennigan, Henegan, Han(n)igan, and Hinegan. Examples of the recordings are Mary Ann Hinegan who married William Webb at St Nicholas Church, Liverpool, on New Years Day, 1861, and Mary Hinegan, christened at Carney, Co. Sligo, on December 15th 1866. The first recorded spelling of the family name is shown to be that of John Hannigane, which was dated 1556, a burgess of Waterford City, County Waterford, during the reign of Queen Mary 1 of England, known as 'Bloody Mary' 1554 - 1558. Surnames became necessary when governments introduced personal taxation. In England this was known as Poll Tax. Throughout the centuries, surnames in every country have continued to "develop" often leading to astonishing variants of the original spelling.